The chapter provides an overview of the current debate and state of the art in the domain of big data aiming at assessing the current and potential use of information and communications technology (ICT) tools for collaborative governance and policy modelling for opening up government operations and enhance the ‘intelligence’ of the policy-making process. The analysis is based on the roadmapping exercise conducted as part of the CROSSOVER Project: Bridging Communities for Next Generation Policy-Making, an FP7 funded support action of the European Commission, with specific regard to the implications of big data on the research challenges of the Policy-Making 2.0 roadmap, being developed to provide an outline of what technologies are available now for policymakers to improve their work, and what could become available in the future. 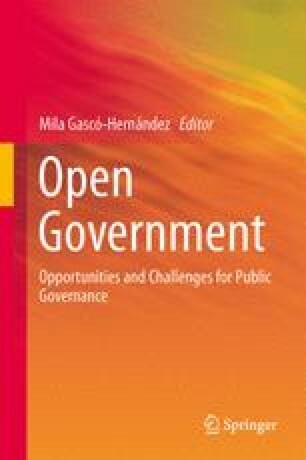 In order to do so, the chapter provides an analysis based on a meta review and selected results of analysis of case studies to identify the characteristics and benefits resulting from applications of big data techniques and methodologies within the context of ICT solutions for collaborative governance and policy modelling, highlighting opportunities, challenges, and current practices in public governance, in Europe and worldwide. Building on the results of the analysis, implications of big data on policy-making are drawn and future research and policy directions are outlined. The views expressed in this paper are purely those of the authors and may not in any circumstances be regarded as stating an official position of the European Commission. Broster, D., Misuraca, G., & Bacigalupo, M. (2011). Lifting off towards open government: A report from the EU Belgian Presidency Conference. European Journal of ePractice (Vol.12) Special Issue on: “The Openness of Government”, March/ April 2011, Edited by Paul Waller and Trond Arne Undheim. http://www.epractice.eu/en/journal/volume/12. Byrnes, J. (2012). Big data: Big opportunity, or big headache? In Leading company online. http://leadingcompany.smartcompany.com.au/big-data/big-data-big-opportunity-or-big-headache/20120307165. Accessed on 13th July 2013. Gartner. (2011). Pattern-based strategy: Getting value from big data. http://www.gartner.com/technology/research/pattern-based-strategy. Accessed on 11th February 2013. Global Research Data Infrastructures 2020. (2011). Final roadmap report. Global research data infrastructures: The big data challenges. http://www.grdi2020.eu/Repository/FileScaricati/6bdc07fb-b21d-4b90-81d4-d909fdb96b87.pdf. Accessed on 22nd March 2013. Kalakota, R. (2012). A primer on big data, Hadoop and “In-memory” data clouds. http://architects.dzone.com/articles/primer-big-data-hadoop-and. Accessed on 16th May 2013. Lorenzts-Augify, A. (2013). Big data, fast data, smart data in Wired insight online magazine. www.wired.com/insights/2013/04/big-data-fast-data-smart-data. Accessed on 21th July 2013. Paul, M., & Dredze, M. (2011). You are what you tweet: Analyzing twitter for public health. International AAAI Conference on Weblogs and Social Media, North America, july 2011. http://www.aaai.org/ocs/index.php/ICWSM/ICWSM11/paper/view/2880. Accessed 09 April 2013. Steinberg, D. (2013). Unlocking the big data goldmine for SMBs in Wired insight online magazine. www.wired.com/insights/2013/04/unlocking-the-big-data-goldmine-for-smbs. Accessed on 21st July 2013. United Nations Global Pulse. (2012). Big data for development: Challenges & opportunities. http://www.unglobalpulse.org/sites/default/files/BigDataforDevelopment-UNGlobalPulseJune2012.pdf. Accessed on 11th May 2013. Vercellis, C. (2013). Big data: la parola a chi li ha già analizzati. ICT4Executive. A cura di Gianni. http://www.ict4executive.it/executive/news/big-data-l-parola-a-chi-li-ha-gia-analizzati. Accessed on 21st July 2013.